คำปฏิญาณตนเข้ารับอิสลามคือการกล่าวคำเป็นภาษาอาหรับว่า "อัชฮะดุ อัลลา อิลาหะ อินลัลลอหฺ วะอัชฮะดุ อันนะ มุฮัมมะดัร รอซูลุลลอหฺ" มีความหมายในภาษาไทยว่า "ข้าขอปฏิญาณว่าไม่มีพระเจ้าอื่นใดนอกจากอัลลอหฺ และข้าขอปฏิญาณว่า นบีมุฮัมมัดเป็นศาสนทูตแห่งพระองค์"
↑ Lipka, Michael; Hackett, Conrad (6 April 2017). 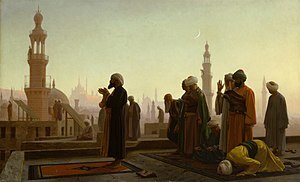 "Why Muslims are the world's fastest-growing religious group". pewresearch.org. Archived from the original on 23 August 2017. สืบค้นเมื่อ 23 August 2017. ↑ 2.0 2.1 2.2 2.3 2.4 "The Future of World Religions: Population Growth Projections, 2010–2050". Pew Research Center. 2 April 2015. Archived from the original on 22 February 2017. สืบค้นเมื่อ 22 February 2017. ↑ "Muslim Population by Country". The Future of the Global Muslim Population. Pew Research Center. Archived from the original on 9 February 2011. สืบค้นเมื่อ 22 December 2011. ↑ "The World Factbook — Central Intelligence Agency". www.cia.gov (in อังกฤษ). Archived from the original on 10 December 2008. สืบค้นเมื่อ 24 May 2017. ↑ "The World Factbook — Central Intelligence Agency". www.cia.gov (in อังกฤษ). Archived from the original on 3 July 2015. สืบค้นเมื่อ 5 November 2017. ↑ "Muslim Population in India - Muslims in Indian States". www.indiaonlinepages.com. Archived from the original on 8 September 2017. สืบค้นเมื่อ 4 October 2017. ↑ "The Future of the Global Muslim Population". Pew Research Center's Religion & Public Life Project (in อังกฤษ). 15 January 2011. Archived from the original on 24 May 2017. สืบค้นเมื่อ 24 May 2017. ↑ "The World Factbook". Archived from the original on 2 May 2009. สืบค้นเมื่อ 31 December 2017. ↑ "The World Factbook". Archived from the original on 11 June 2008. สืบค้นเมื่อ 31 December 2017. ↑ "The World Factbook". Archived from the original on 19 November 2012. สืบค้นเมื่อ 31 December 2017. ↑ "The World Factbook". Archived from the original on 20 September 2017. สืบค้นเมื่อ 31 December 2017. ↑ United Nations High Commissioner for Refugees. "Refworld - 2010 Report on International Religious Freedom - China (includes Tibet, Hong Kong, Macau)". Refworld. Archived from the original on 17 October 2012. สืบค้นเมื่อ 14 February 2015. ↑ "The World Factbook". Archived from the original on 17 January 2010. สืบค้นเมื่อ 14 February 2015. ↑ "The World Factbook". Archived from the original on 13 May 2009. สืบค้นเมื่อ 14 February 2015. ↑ "The World Factbook". Archived from the original on 23 February 2011. สืบค้นเมื่อ 14 February 2015. ↑ "The World Factbook". Archived from the original on 20 September 2017. สืบค้นเมื่อ 14 February 2015. ↑ "The World Factbook". Archived from the original on 13 October 2012. สืบค้นเมื่อ 14 February 2015. ↑ "The World Factbook". Archived from the original on 12 June 2007. สืบค้นเมื่อ 14 February 2015. ↑ "The World Factbook". Archived from the original on 22 May 2010. สืบค้นเมื่อ 14 February 2015. ↑ "The World Factbook". Archived from the original on 28 December 2010. สืบค้นเมื่อ 14 February 2015. ↑ Grim, Brian J.; Johnson, Todd M. (2013). ﻿Chapter 1: Global Religious Populations, 1910–2010﻿ (รายงาน). John Wiley & Sons, Ltd.. p. 22. Archived from the original on 20 October 2013. https://web.archive.org/web/20131020100448/http://media.johnwiley.com.au/product_data/excerpt/47/04706745/0470674547-196.pdf. เรียกข้อมูลเมื่อ 10 March 2017. ↑ Al-Jallad, Ahmad. "Polygenesis in the Arabic Dialects" (in อังกฤษ). Archived from the original on 15 August 2016. ↑ 23.0 23.1 "Mapping the Global Muslim Population: A Report on the Size and Distribution of the World's Muslim Population" (PDF). Pew Research Center. October 2009. Archived (PDF) from the original on 5 February 2017. สืบค้นเมื่อ 22 February 2017. Of the total Muslim population, 10–13% are Shia Muslims and 87–90% are Sunni Muslims. ↑ 24.0 24.1 "Chapter 1: Religious Affiliation". The World’s Muslims: Unity and Diversity. Pew Research Center's Religion & Public Life Project. 9 August 2012. Archived from the original on 26 December 2016. สืบค้นเมื่อ 4 September 2013. ↑ The Qurʼan and Sayings of Prophet Muhammad: Selections Annotated & Explained. SkyLight Paths Publishing. 2007. pp. 21–. ISBN 978-1-59473-222-5. สืบค้นเมื่อ 31 August 2013. หน้านี้แก้ไขล่าสุดเมื่อวันที่ 15 ธันวาคม 2561 เวลา 07:39 น.